Today we begin a new occasional blog series called "Case Report Shorts." As their name implies, "Case Report Shorts" will be short summaries of cases that we come across. In order to make these "Short Reports" possible, brevity and clarity will be emphasized. Our aim of these reports, as with our blog in general, will be to both to enlighten and inform others of the complexities involved in companion animal health care. Our first Case Report Short is Elaine Tran. Elaine Tran is Dr. Tran's own 11 year old pit bull mix. Even though Elaine seemed fine (she had been acting fine, eating fine, etc.) in September Elaine had a blood test administered as part of a routine senior and pre-dentistry check-up. Some of the results were somewhat abnormal but since Elaine was otherwise fine, Dr. Tran decided to postpone the dentistry and re-retest her a few months later. In January Dr. Tran proceeded with the follow-up diagnostic tests. Unfortunately, the follow-up blood test was much worse. It was now obvious that Elaine, still acting "fine on the outside," was having some type of serious medical problem. As a result of that follow-up test, Elaine had an xray, then an ultrasound a few days later. The xray seemed to show some sort of round mass in her abdomen; the ultrasound confirmed the mass to be a "splenic mass." Even though the splenic mass did not appear to be at risk of rupturing, Dr. Tran elected to have it removed as urgently as possible. Elaine's liver also appeared abnormal on the ultrasound (which was not surprising considering the abnormal liver values on her blood test); so the initial plan was to biopsy (to get some samples for testing) her liver during surgery. Lateral (side) view of Elaine's abdomen. Red arrows outline the round mass on her spleen. Less than a week after the ultrasound, Elaine was admitted to Animal Emergency and Medical Center in Torrance for her splenectomy (surgery to remove her spleen). Surprisingly, her pre-surgical blood test showed an anemia that was not there a week ago. The reason was revealed when the surgeon entered Elaine's abdomen. 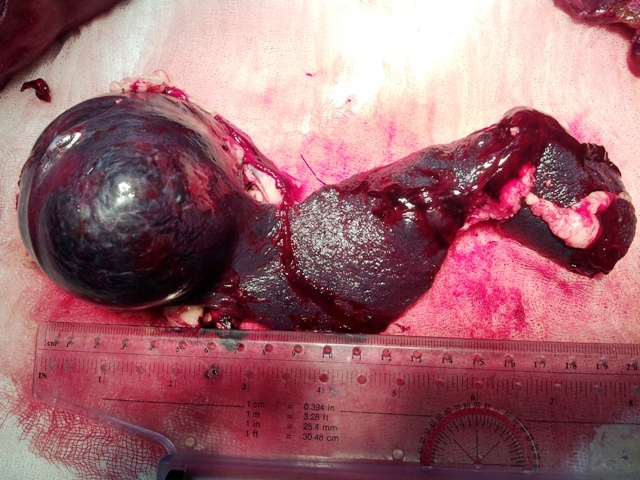 The splenic mass had developed a small crack and had started to bleed. The surgeon was met with another surprise when he checked the liver --- a large mass occupied one of Elaine's liver lobes. In addition to removing the spleen, the surgeon had to remove 2 of her liver lobes to completely remove the mass. Indeed, even though Elaine was "acting fine" on the outside, it is conceivable that had she not had that surgery, she would, at the minimum, have developed a hemoabdomen (blood in her abdomen) as her splenic mass had started to bleed. Or she would have developed more complications from the liver mass. The surgery proved complicated and long, but was successful. Still, her recovery was somewhat difficult. She wouldn't eat or drink and she remained very weak. When she finally had an appetite, she would vomit anything she ate the first couple of days. It's been 2 weeks since her surgery and Elaine is finally showing glimpses of her normal self. The growths themselves were tested. The growth on Elaine's spleen was a benign mass -- surgical removal was curative. The growth on her liver was a well differentiated hepatocellular carcinoma. Although we have to monitor her other liver lobes (via ultrasound) for recurrence, the overall prognosis is good for Elaine. We could not have wished for a better outcome. Today (February 14th) is Elaine's 12th Birthday. Thanks to the help from AEMC, we hope to have Elaine with us for many more to come.